• John Baez, John Foley and Joe Moeller, Network models from Petri nets with catalysts. Check it out! And please report typos, mistakes, or anything you have trouble understanding! I’m happy to answer questions here. 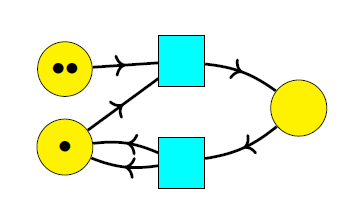 Petri nets are a widely studied formalism for describing collections of entities of different types, and how they turn into other entities. I’ve written a lot about them here. Network models are a formalism for designing and tasking networks of agents, which our team invented for this project. Here we combine these ideas! This is worthwhile because while both formalisms involve networks, they serve a different function, and are in some sense complementary. Thus, the places represent different types of entity, and the transitions are ways that one collection of entities of specified types can turn into another such collection. Network models serve a different function than Petri nets: they are a general tool for working with networks of many kinds. 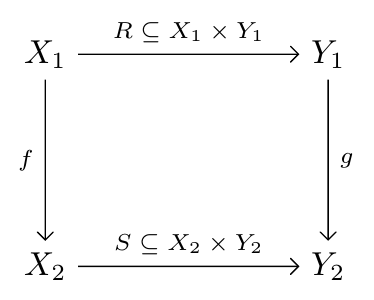 Mathematically a network model is a lax symmetric monoidal functor where is the free strict symmetric monoidal category on a set Elements of represent different kinds of ‘agents’. Unlike in a Petri net, we do not usually consider processes where these agents turn into other agents. Instead, we wish to study everything that can be done with a fixed collection of agents. Any object is of the form for some thus, it describes a collection of agents of various kinds. The functor maps this object to a category that describes everything that can be done with this collection of agents. • John Baez, John Foley, Joe Moeller and Blake Pollard, Network models. • Joe Moeller, Noncommutative network models. This lets us design networks where each agent has a limit on how many communication channels or commitments it can handle; the noncommutativity lets us take a ‘first come, first served’ approach to resolving conflicting commitments. Here we take a different tack: we instead take to be a category whose morphisms are processes that the given collection of agents, can carry out. 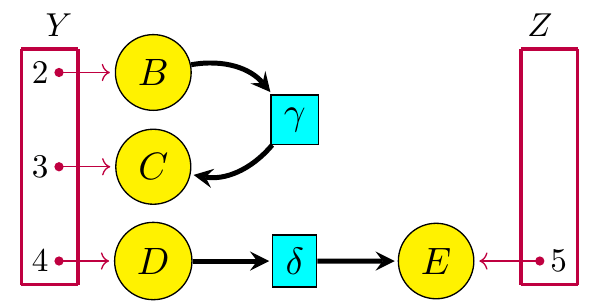 Composition of morphisms corresponds to carrying out first one process and then another. 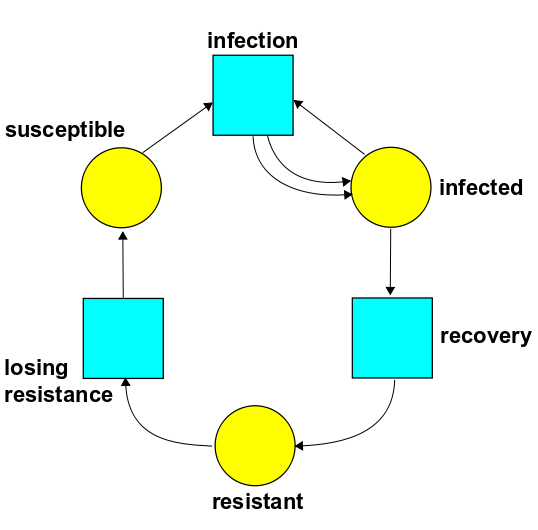 Given a Petri net, then, how do we construct a network model and in particular, what is the set ? In a network model the elements of represent different kinds of agents. In the simplest scenario, these agents persist in time. Thus, it is natural to take to be some set of ‘catalysts’. In chemistry, a reaction may require a catalyst to proceed, but it neither increases nor decrease the amount of this catalyst present. In everyday life, a door serves as a catalyst: it lets you walk though a wall, and it doesn’t get used up in the process! but neither nor is a catalyst. 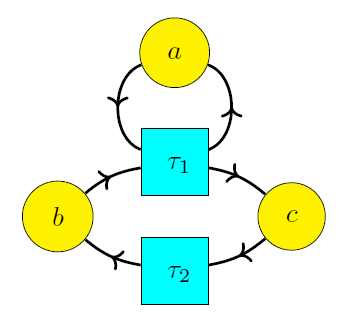 The transition requires one token of type as input to proceed, but it also outputs one token of this type, so the total number of such tokens is unchanged. Similarly, the transition requires no tokens of type as input to proceed, and it also outputs no tokens of this type, so the total number of such tokens is unchanged. An object says how many tokens of each catalyst are present; is then the subcategory of where the objects are markings that have this specified amount of each catalyst, and morphisms are processes going between these. • Joe Moeller and Christina Vasilakopoulou, Monoidal Grothendieck construction. There are no morphisms between an object of and an object of when since no transitions can change the amount of catalysts present. The category is thus a ‘disjoint union’, or more technically a coproduct, of subcategories where an element of free commutative monoid on specifies the amount of each catalyst present. 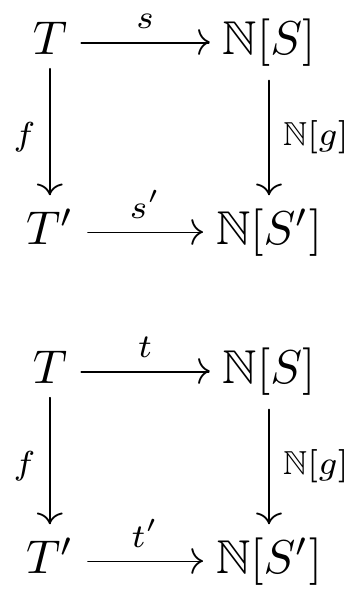 The tensor product on has the property that tensoring an object in with one in gives an object in and similarly for morphisms. However, in Theorem 14 we show that each subcategory also has its own tensor product, which describes doing one process after another while reusing catalysts. Here represents the catalysts, and and are two processes which we can carry out using these catalysts. We can do either one first, but we get different morphisms as a result. The paper has lots of pictures like this—many involving jeeps and boats, which serve as catalysts to carry people first from a base to the shore and then from the shore to an island. I think these make it clear that the underlying ideas are quite commonsensical. But they need to be formalized to program them into a computer—and it’s nice that doing this brings in some classic themes in category theory! I’ve been asleep at the switch; this announcement is probably too late for anyone outside the UK. But still, it’s great to see how applied category theory is taking off! And this conference is part of a series, so if you miss this one you can still go to the next. • Second Symposium on Compositional Structures (SYCO2), 17-18 December 2018, University of Strathclyde, Glasgow. The Symposium on Compositional Structures (SYCO) is an interdisciplinary series of meetings aiming to support the growing community of researchers interested in the phenomenon of compositionality, from both applied and abstract perspectives, and in particular where category theory serves as a unifying common language. The first SYCO was held at the School of Computer Science, University of Birmingham, 20-21 September, 2018, attracting 70 participants. This new series aims to bring together the communities behind many previous successful events which have taken place over the last decade, including “Categories, Logic and Physics”, “Categories, Logic and Physics (Scotland)”, “Higher-Dimensional Rewriting and Applications”, “String Diagrams in Computation, Logic and Physics”, “Applied Category Theory”, “Simons Workshop on Compositionality”, and the “Peripatetic Seminar in Sheaves and Logic”. SYCO will be a regular fixture in the academic calendar, running regularly throughout the year, and becoming over time a recognized venue for presentation and discussion of results in an informal and friendly atmosphere. To help create this community, and to avoid the need to make difficult choices between strong submissions, in the event that more good-quality submissions are received than can be accommodated in the timetable, the programme committee may choose to defer some submissions to a future meeting, rather than reject them. This would be done based largely on submission order, giving an incentive for early submission, but would also take into account other requirements, such as ensuring a broad scientific programme. Deferred submissions would be accepted for presentation at any future SYCO meeting without the need for peer review. This will allow us to ensure that speakers have enough time to present their ideas, without creating an unnecessarily competitive reviewing process. Meetings would be held sufficiently frequently to avoid a backlog of deferred papers. I’m helping organize ACT 2019, an applied category theory conference and school at Oxford, July 15-26, 2019. As part of a new growing community in Applied Category Theory, now with a dedicated journal Compositionality, a traveling workshop series SYCO, a forthcoming Cambridge U. Press book series Reasoning with Categories, and several one-off events including at NIST, we launch an annual conference+school series named Applied Category Theory, the coming one being at Oxford, July 15-19 for the conference, and July 22-26 for the school. The dates are chosen such that CT 2019 (Edinburgh) and the ACT 2019 conference (Oxford) will be back-to-back, for those wishing to participate in both. There already was a successful invitation-only pilot, ACT 2018, last year at the Lorentz Centre in Leiden, also in the format of school+workshop. For the conference, for those who are familiar with the successful QPL conference series, we will follow a very similar format for the ACT conference. This means that we will accept both new papers which then will be published in a proceedings volume (most likely a Compositionality special Proceedings issue), as well as shorter abstracts of papers published elsewhere. There will be a thorough selection process, as typical in computer science conferences. 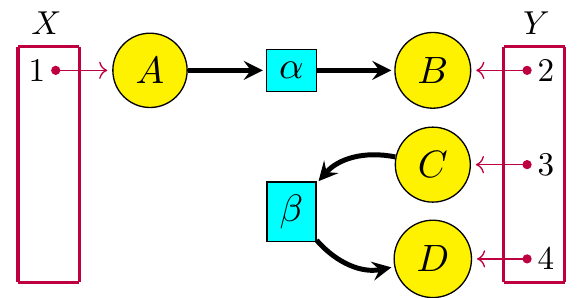 The idea is that all the best work in applied category theory will be presented at the conference, and that acceptance is something that means something, just like in CS conferences. This is particularly important for young people as it will help them with their careers. Expect a call for submissions soon, and start preparing your papers now! The school in ACT 2018 was unique in that small groups of students worked closely with an experienced researcher (these were John Baez, Aleks Kissinger, Martha Lewis and Pawel Sobociński), and each group ended up producing a paper. We will continue with this format or a closely related one, with Jules Hedges and Daniel Cicala as organisers this year. As there were 80 applications last year for 16 slots, we may want to try to find a way to involve more students. We are fortunate to have a number of private sector companies closely associated in some way or another, who will also participate, with Cambridge Quantum Computing Inc. and StateBox having already made major financial/logistic contributions. John Foley, Joe Moeller and I have made some nice progress on compositional tasking for the Complex Adaptive System Composition and Design Environment project. ‘Compositional tasking’ means assigning tasks to networks agents in such a way that you can connect or even overlay such tasked networks and get larger ones. This lets you build up complex plans from smaller pieces. In my last post in this series, I sketched an approach using ‘commitment networks’. 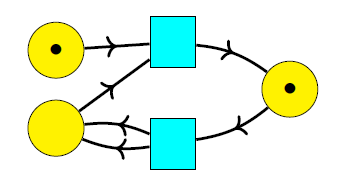 A commitment network is a graph where nodes represent agents and edges represent commitments, like “A should move toward B either for 3 hours or until they meet, whichever comes first”. By overlaying such graphs we can build up commitment networks that describe complex plans of action. The rules for overlaying incorporate ‘automatic deconflicting’. In other words: don’t need to worry about agents being given conflicting duties as you stack up plans… because you’ve decided ahead of time what they should do in these situations. I still like that approach, but we’ve been asked to develop some ideas more closely connected to traditional methods of tasking, like PERT charts, so now we’ve done that. ‘PERT’ stands for ‘program evaluation and review technique’. PERT charts were developed by the US Navy in 1957, but now they’re used all over industry to help plan and schedule large projects. The nodes in this graph are different states, like “you have built the car but not yet put on the tires”. The edges are different tasks, like “put the tires on the car”. Each state is labelled with an arbitrary name: 10, 20, 30, 40 and 50. The tasks also have names: A, B, C, D, E, and F. More importantly, each task is labelled by the amount of time that task requires! • What’s the minimum amount of time it takes to get from state 10 to state 50? • Which tasks could take longer, without changing the answer to the previous question? How much longer could each task take, without changing the answer? This amount of time is called the slack for that task. There are known algorithms for solving such problems. These help big organizations plan complex projects. So, connecting compositional tasking to PERT charts seems like a good idea. At first this seemed confusing because in our previous work the nodes represented agents, while in PERT charts the nodes represent states. Of course graphs can be used for many things, even in the same setup. But the trick was getting everything to fit together nicely. Now I think we’re close. 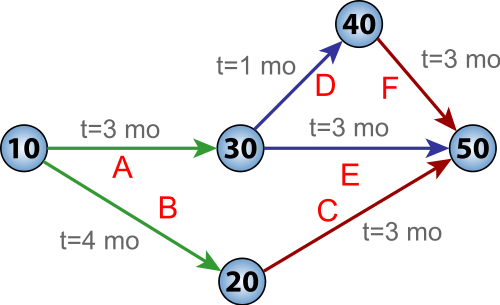 John Foley has been working out some nice example problems where a collection of agents need to move along the edges of a graph from specified start locations to specified end locations, taking routes that minimize their total fuel usage. However, there are some constraints. Some edges can only be traversed by specified teams of agents: they can’t go alone. Also, no one agent is allowed to run out of fuel. This is a nice problem because while it’s pretty simple and specific, it’s representative of a large class of problems where a collection of agents are trying to carry out tasks together. ‘Moving along the edge of a graph’ can stand for a task of any sort. 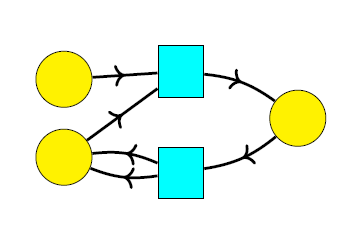 The constraint that some edges can only be traversed by specified teams is then a way of saying that certain tasks can only be accomplished by teams. Furthermore, there are nice software packages for optimization subject to constraints. For example, John likes one called Choco. So, we plan to use one of these as part of the project. What makes this all compositional is that John has expressed this problem using our ‘network model’ formalism, which I began sketching in Part 6. This allows us to assemble tasks for larger collections of agents from tasks for smaller collections. Here, however, an idea due to my student Joe Moeller turned out to be crucial. In our first examples of network models, explained earlier in this series, we allowed a monoid of networks for any set of agents of different kinds. A monoid has a binary operation called ‘multiplication’, and the idea here was this could describe the operation of ‘overlaying’ networks: for example, laying one set of communication channels, or committments, on top of another. 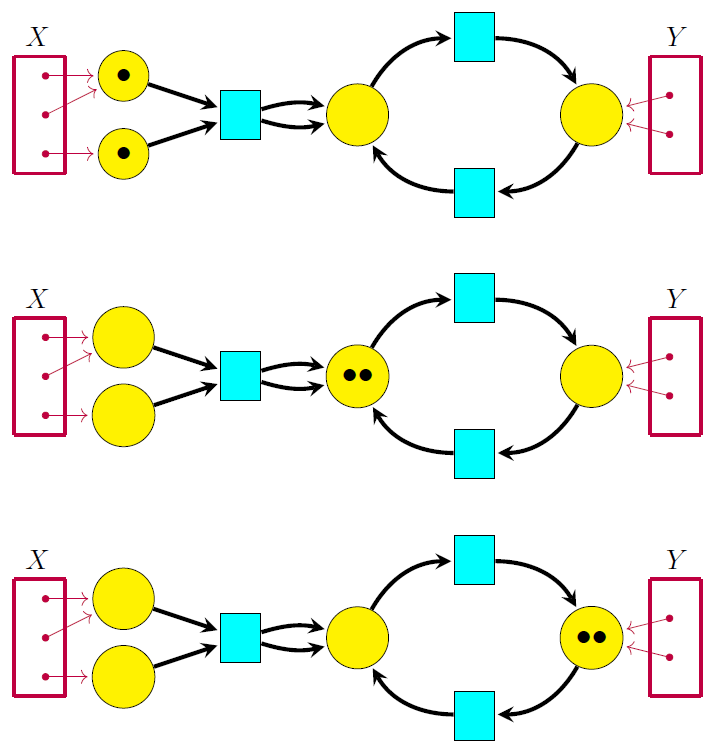 However, Joe knew full well that a monoid is a category with one object, so he pushed for a generalization that allowed not just a monoid but a category of networks for any set of agents of different kinds. I didn’t know what this was good for, but I figured: what the heck, let’s do it. It was a mathematically natural move, and it didn’t make anything harder—in fact it clarified some of our constructions, which is why Joe wanted to do it. Now that generalization is proving to be crucial! 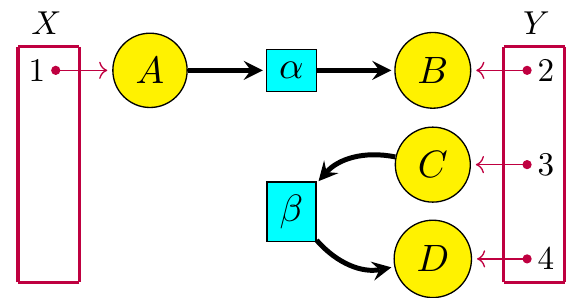 We can take our category of networks to have states as objects and tasks (ways of moving between states) as morphisms! So, instead of ‘overlaying networks’, the basic operation is now composing tasks. So, we now have a framework where if you specify a collection of agents of different kinds, we can give you the category whose morphisms are tasks those agents can engage in. An example is John’s setup where the agents are moving around on a graph. But this framework also handles PERT charts! While the folks who invented PERT charts didn’t think of them this way, one can think of them as describing categories of a certain specific sort, with states as objects and tasks as morphisms. So, we now have a compositional framework for PERT charts. • Open Petri nets (part 3), Azimuth, 19 August 2018. The key is the relation between Petri nets and PERT charts. I’ll have more to say about that soon, I hope! 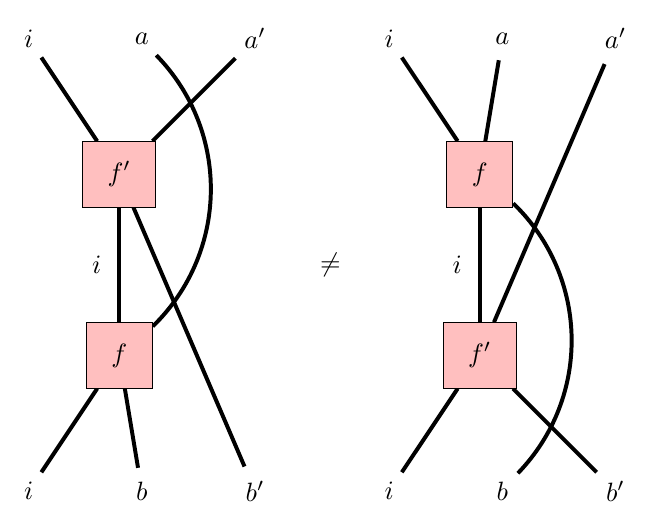 In Part 1 we saw the double category of open Petri nets; in Part 2 we saw the reachability semantics for open Petri nets as a double functor. Now I’d like to wrap up by showing you the engine beneath the hood of our results. I fell in love with Petri nets when I realized that they were really just presentations of free symmetric monoidal categories. If you like category theory, this turns Petri nets from something mysterious into something attractive. In any category you can compose morphisms and and get a morphism In a monoidal category you can also tensor morphisms and and get a morphism This of course relies on your ability to tensor objects. In a symmetric monoidal category you also have And of course, there is more to it than this. But this is enough to get started. (built using the transition recovery) and so on. Here we are using to denote the tensor product in our symmetric monoidal category, as usual in chemistry. 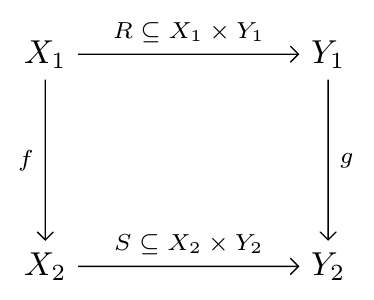 When we do this sort of construction, the resulting symmetric monoidal category is ‘free’. That is, we are not imposing any really interesting equations: the objects are freely generated by the places in our Petri net by tensoring, and the morphisms are freely generated by the transitions by tensoring and composition. That’s the basic idea. The problem is making this idea precise! • José Meseguer and Ugo Montanari, Petri nets are monoids, Information and Computation 88 (1990), 105–155. but I think it can be simplified a bit, so let me describe what Jade and I did in our paper. It took me a while to accept this, but now it seem obvious. If you want a nontrivial braiding, you should be using something a bit fancier than a Petri net. 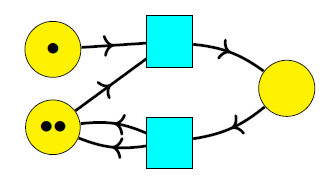 There is a category with Petri nets as objects and Petri net morphisms as morphisms. are all identity morphisms. 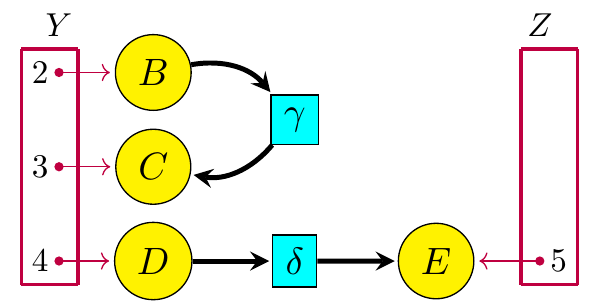 Every strict monoidal functor between commutative monoidal categories is automatically a strict symmetric monoidal functor. So, we let be the category whose objects are commutative monoidal categories and whose morphisms are strict monoidal functors. as its source and target maps. This is Proposition 10 in our paper, and we give an explicit construction of this left adjoint. So that’s our conception of the free commutative monoidal category on a Petri net. It’s pretty simple. How could anyone have done anything else? Montanari and Meseguer do almost the same thing, but our category of Petri nets is a subcategory of theirs: our morphisms of Petri nets send places to places, while they allow more general maps that send a place to a formal linear combination of places. On the other hand, they consider a full subcategory of our containing only commutative monoidal categories whose objects form a free commutative monoid. • Pierpaolo Degano, José Meseguer and Ugo Montanari, Axiomatizing net computations and processes, in Logic in Computer Science 1989, IEEE, New Jersey, 1989, pp. 175–185. • Vladimiro Sassone, Strong concatenable processes: an approach to the category of Petri net computations, BRICS Report Series, Dept. of Computer Science, U. Aarhus, 1994. • Vladimiro Sassone, On the category of Petri net computations, in Colloquium on Trees in Algebra and Programming, Springer, Berlin, 1995. • Vladimiro Sassone, An axiomatization of the algebra of Petri net concatenable processes, in Theoretical Computer Science 170 (1996), 277–296. • Vladimiro Sassone and Pavel Sobociński, A congruence for Petri nets, Electronic Notes in Theoretical Computer Science 127 (2005), 107–120. Getting the free commutative monoidal category on a Petri net right is key to developing the reachability semantics for open Petri nets in a nice way. But to see that, you’ll have to read our paper!